Gary received a BS degree with honors (Tau Beta Pi; Alpha Pi Mu) in Industrial Engineering/Operations Research from Cornell University in 1971. He was a two year varsity football letterman. He received his MBA with honors (Beta Gamma Sigma) from Northwestern University’s Kellogg School of Management in 1974. Gary began his career as a strategic planner with FMC Corporation and subsequently served as Financial Controller and Operations Manager with FMC’s Link-Belt division. In 1981 Gary began his management consulting career first with Deloitte Consulting. Next with KPMG, Gary was trained on activity-based costing (ABC) by Harvard Business School Professors Robert S. Kaplan and Robin Cooper. With KPMG working with Dr. David Norton, Gary was also involved with initial research that led to the development of the Balanced Scorecard. Prior to joining SAS, Gary headed the National Cost Management Consulting Services for Electronic Data Systems (EDS), now part of HP. In 1996 Gary joined ABC Technologies which was acquired in 2002 by SAS, a leading provider of enterprise performance management and business analytics software, headquartered in Cary, North Carolina. At SAS he was a principal consultant and retired in 2012. Gary was the lead author of the acclaimed An ABC Manager’s Primer (ISBN 0-86641-220-4), sponsored by the Institute of Management Accountants (IMA). Gary’s second book, Activity Based Cost Management: Making it Work (ISBN 0-7863-0740-4), was judged by the Harvard Business School Press as “read this book first.” A reviewer for Gary’s third book, Activity Based Cost Management: An Executive’s Guide (ISBN 0-471-44328-X) said, Gary has the gift to take the concept that many view as complex and reduce it to its simplest terms.” This book was ranked number one in sales volume of 151 similar books on BarnesandNoble.com. Gary has also written Activity Based Cost Management in Government (ISBN 1-056726-110-8). His five most recent books are Performance Management: Finding the Missing Pieces to Close the Intelligence Gap (ISBN 0-471-57690-5), Performance Management: Integrating Strategy Execution, Methodologies, Risk, and Analytics (ISBN 978-0-470-44998-1), Strategic Business Management: From Planning to Performance (ISBN 978-1-93735-081-9), Budgeting, Planning, and Forecasting in Uncertain Times (ISBN 978-1-94012-531-8), and Predictive Business Analytics (ISBN 978-1-118-17556-9). 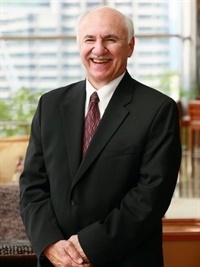 Gary has participated and served on committees including: CAM-I, the Supply Chain Council, the International Federation of Accountants (IFAC), the Institute of Management Accountants, the AICPA, and the American Association of Accountants (AAA). Gary serves on the board of advisers for organizations including an advisory board with Harvard Business School Professor, Robert S. Kaplan, for the International Monetary Fund (IMF).